Compiled by: Etienne Lonfo, Stephen C. Anderson. Series edited by: Roger M. Blench. 9 pp. Roman, 577 pp. 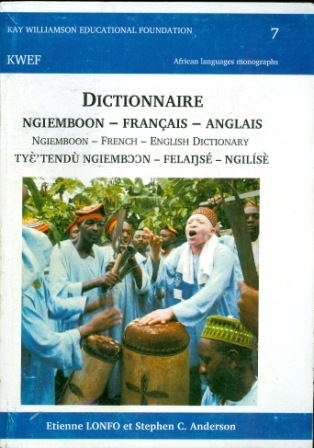 Ngiemboon is spoken by about 100,000 people, mainly in the department Bamboutos in the Western Region of Cameroon. It is a Grassfields Bantu language belonging to the group Bamiléké with more than 250,000 speakers. This dictionary includes an introduction that presents the principle components, a phonological description, orthographic information, an abridged grammatical description, 2 maps, 85 colour photos and annexes with information about people and the region. The dictionary itself comprises approximately 6,200 main entries, 600 secondary inputs (derived forms), 7,700 definitions in both English and French, 1,250 example sentences, 800 dialects, 650 referrals, 200 loans and 100 drawings. The dictionary also includes a French-Ngiemboon language index of about 7,650 entries, an English-Ngiemboon language index of about 8,000, and an index of 575 scientific names of plants and animals.